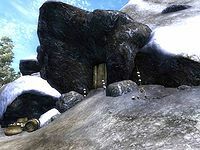 Silver Tooth Cave is a medium-sized cave between Cheydinhal and Bruma containing goblins. 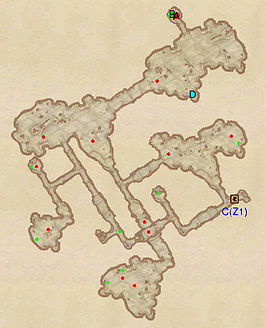 It contains two zones: Silver Tooth Cave and Silver Tooth Warrens. This cave contains 84 Cairn Bolete plants and 106 Wisp Stalk plants. This location's map marker (M on map) is named Silver Tooth Cave (editor name SilverToothCaveMapMarker). The entrance door is N of the marker, 40 feet away. Silver Tooth Cave contains a large number of goblins but a plentiful amount of treasure makes it worth exploring. The first zone greets you with a narrow tunnel; look out for the Pressure Plate at E that activates a Swinging Mace trap (D) when you turn left. Some opposition will greet you after passing this obstacle. At the end of the narrow tunnel, watch out for the Tripwire at G that activates another Swinging Mace (D). You will now find yourself in a large chamber; loot the minor loot chest in the south part of the room near the fire and the bedroll at b. Proceed to the tunnel in the west part of the room which will take you to the upper level of the room. Head north, but take care when crossing the Rotten Plank at F. For now, ignore the first tunnel on the left that you will see and head into the second one. After following the tunnel, you will find yourself in a room with a chest containing minor loot guarded by one foe. Continue forward into another tunnel until you enter a room guarded by three foes. It is advisable to take care of these enemies before entering the next room which has two more foes. Be sure to loot the locked chest after taking care of the opposition. Proceed forward and you will soon find yourself back in the large, central chamber. Make your way back to the previously ignored tunnel near the Rotten Plank. You will now find yourself in a smaller room with one opponent and a chest containing potions. After taking care of this, proceed through door C into Silver Tooth Warrens. The goal of this zone is to reach the boss chest located at B. The zone greets you with an intersection; head straight and continue down the tunnel until you reach another intersection. You should ignore the left path as it only leads to a dead end guarded by one foe, who can be avoided if you are stealthy. Heading straight is much more rewarding as it leads to a locked chest containing minor loot. Make your way back to the intersection at the beginning of the zone and make a left turn. Head to the right corner of this new room to loot a chest guarded by one foe. Afterwards, proceed to the tunnel at the west part of the room. You will quickly find yourself at an intersection; head left and follow the path to a room with two chests guarded by two enemies. Head back into the tunnel and proceed straight ahead until you find yourself in a new room. Head to the right where you will find yourself in a room that greets you with a fire and a foe. 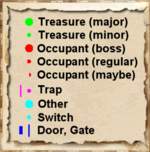 In the south corner of this room is a Dead Captive behind a locked gate at D; check his body as it may contain an enchanted piece of jewelry that he will not be needing anymore. Proceed to the north part of the room where you will meet a boss-level goblin at A. After defeating it, loot the locked boss chest at B and also a minor loot chest right beside it. Once this is done, turn right to head past the fire back into the previous chamber and make a left turn into the second tunnel of this room. Shortly after entering the tunnel, make a right turn to reach another intersection. Turning right will lead to a chest guarded by one foe, whereas turning left will lead to a small room containing a locked chest and an enemy. Return back to the main tunnel and proceed south until you see another chest. 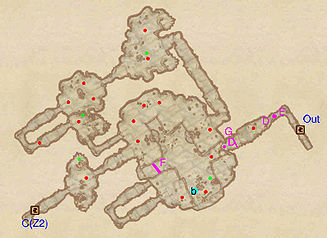 Loot this chest and then head back north as the other paths lead to dead ends. Make your way back to door C to head back to Silver Tooth Cave. This page was last modified on 25 March 2018, at 03:13.